We spent a month traveling in Indonesia and were pleasantly surprised at how easy it is to find a variety of vegan options. Although we only visited three islands in the archipelago – Java, Bali and Lombok – we certainly got a good taste of the country’s cuisine. All across Indonesia tofu and tempeh are staples and they show up in numerous appetizers and main dishes. For us, it was a bit difficult to get used to the flavor and texture of tempeh, a fermented soy bean cake that was invented in Indonesia, but the taste slowly grew on us, especially when it’s marinated and fried crispy. By the end of the trip we couldn’t get enough! A number of other ubiquitous meals can easily be made vegan, such as gado gado and nasi goreng, just by omitting the egg and cracker (made with fish). Keep in mind, however, that although the concept of vegetarian is widely understood, extending the dietary restrictions to include eggs and dairy (not to mention honey) was more of a challenge at restaurants and home stay breakfasts. For example, “no milk” may be understood, but locals didn’t seem to extrapolate that butter or cheese should not be included in our meal, too. We learned to simply give them a list of all the ingredients separately and guest house owners were happy to oblige us. 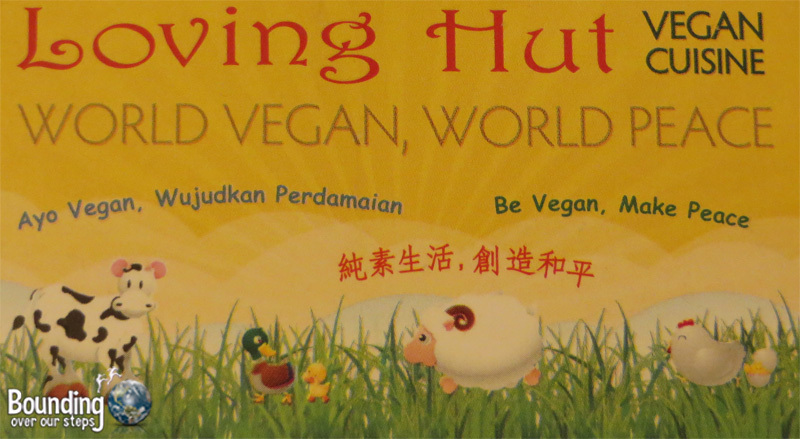 On our travels through Java and Bali, we became frequent patrons to The Loving Hut, a chain of vegan restaurants with franchises in Jakarta, Yogyakarta, Surabaya, Singaraja and Denpasar. The philosophy of “Be Vegan, Make Peace” aligns perfectly with our beliefs and it doesn’t hurt that their food is also delicious. Their vast array of Western dishes was a welcomed change to the often-ordered, and definitely enjoyed, Indonesian dishes. A highlight for our taste buds was our time on Gili Air, an island off the northwestern coast of Lombok. It was there that we discovered traditional Sasak cuisine, including Urap Urap and Olah Olah. Not only are these dishes already traditionally and deliciously vegan, they are also organic and local in that they are prepared using the delicious coconuts growing everywhere on the island. Lastly, we spent about a third of our vacation in Ubud, located in the south central part of the island of Bali. It would appear that a constant stream of health-minded yogis have increased the demand for vegetarian food in this cultural center and so, restaurants are understandably catering their menus to offer more meat-free options. Some restaurants even went so far as to advertise as “vegetarian” and only upon closer inspection of the menu did we see the fine print that meat options (often outnumbering the vegetarian and vegan options) were also available. In general, we observed that vegan food in Ubud got put under the same umbrella as “gluten-free” and/or “low calorie” sections on the menu. In short, we found that the majority of those looking for vegan options were mostly interested in veganism from a health perspective instead of a moral obligation to animals. 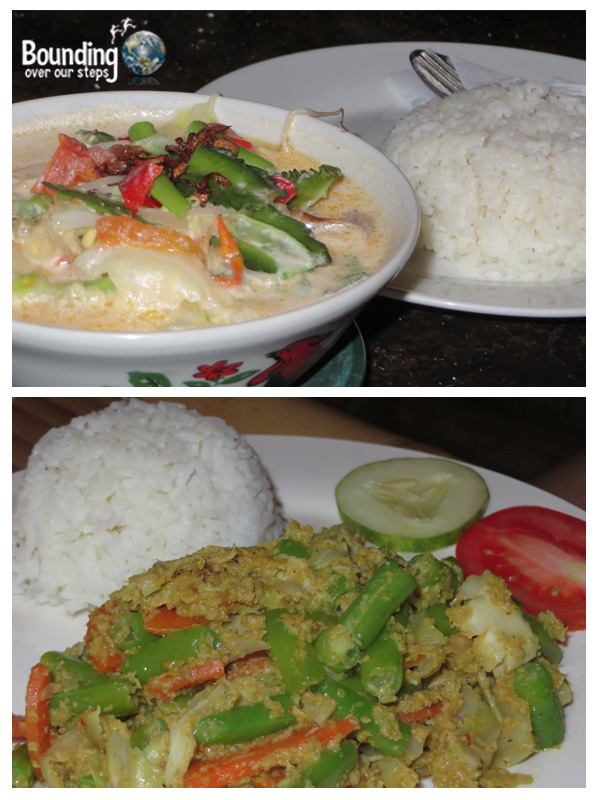 Still, we were happy to find a trio of restaurants on Jalan Sugriwa that we visited daily. Overall, eating our way through a month in Indonesia was not only delicious, but it was relatively pain-free. We have been to some countries, such as the Philippines, where our only option was picking up packages of nuts and seeds from the local mini-mart. 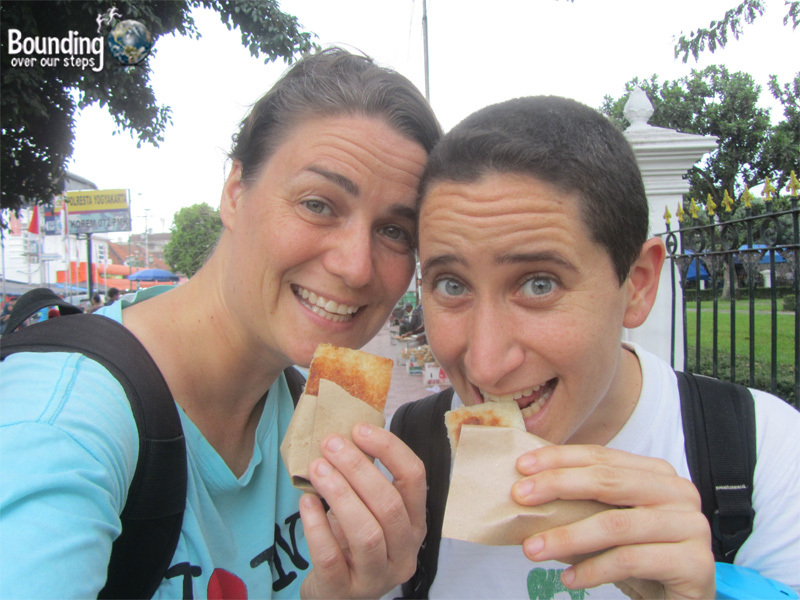 And unlike some of our other trips, we actually gained weight on our Indonesian vacation. Where in Indonesia have you enjoyed vegan cuisine? Even this meat-eater is drooling at all these lovely dishes!! Tempeh is pretty easy to make, especially in warm weather. (It needs a constant 90 degrees F in its early stages of growth. Later on it makes its own heat.) You only need soybeans, water, and the starter (check Google for tempeh starter). And really it is not fermented, like pickles or sauerkraut are. It is “cultured” and is more like mushrooms — something alive — with mycelia that poke into the soybean pieces and pre-digest them. In your pictures, the tempeh does not have any dark spots, which actually add to the flavor. The dark spots appear near the end of the culturing. Also you can make it with part brown rice, which I think makes it even more delicious. I am so glad I am eating as I read this, otherwise this would make me hungry. Although, let’s be real, that mango coconut sweetness looks amazing. Don’t feel too bad about the Philippines — my only dietary restriction is that I don’t eat fish and I nearly starved there as well 🙂 Glad Indonesia was a little easier for you! I’m wondering if you could help please – I’m going to Lombok tomorrow for a week but am struggling to find lists of words that us vegans would find handy.. any chance you can help if this is still floating around in your memory somewhere? 🙂 many thanks!! Thank you. I am going soon and was worried about this. Great tips! We are headed to Indonesia next month after Thailand and really looking forward to the tempeh, we love it! 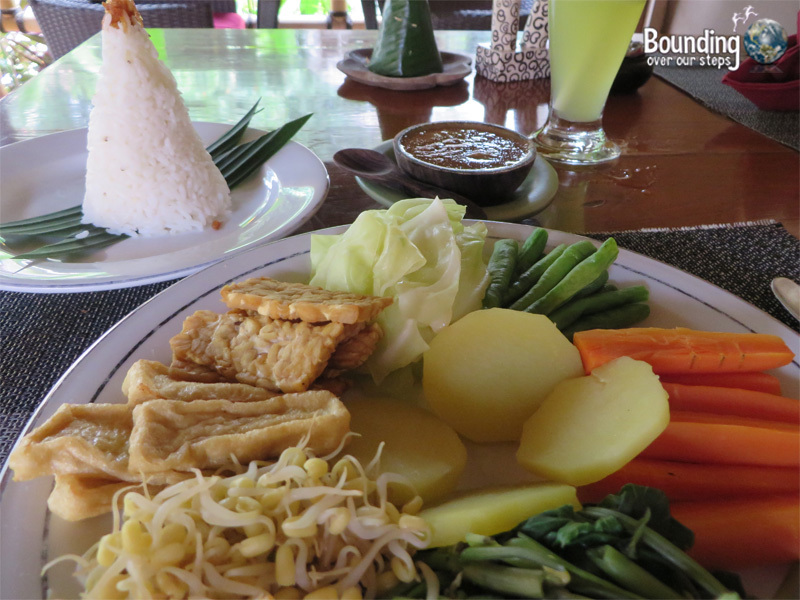 I’ve heard alot about the vegan food in Ubud, and raw food too! Did you find Ubud restaurants to be more expensive? How exciting that you’ll be going to Indonesia. There are so many great places to visit! In Java, I think your best bet will be to find the Loving Hut restaurants as much as you can. 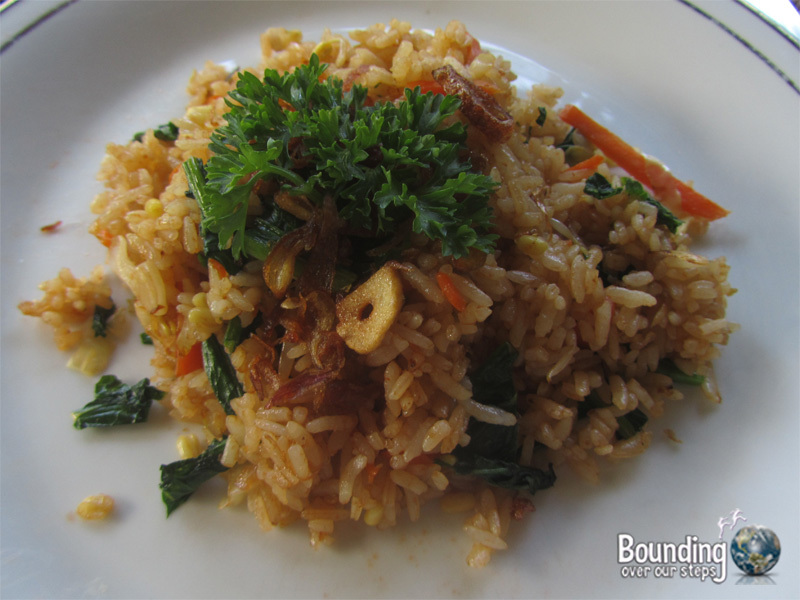 Here is a link to our review of them: http://www.boundingoveroursteps.com/loving-hut-jarkarta-indonesia/. 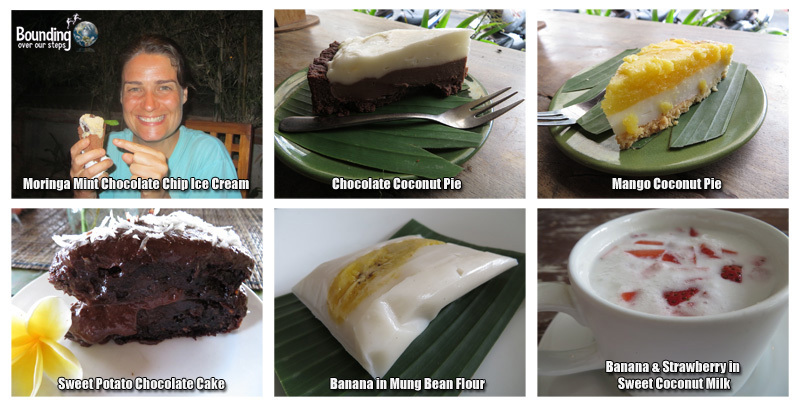 Here is another post about the restaurants we frequented in Bali on Jalan Sugriwa, that includes the vegan cakes: http://www.boundingoveroursteps.com/eating-vegan-ubud-bali/. As for Gili Air, we can remember the exact name of the restaurant but it was on the west side of the island – the entire island can be walked in an hour. They had a large menu with nice tables and chairs right on the beach. You can go into any restaurant there and ask for Urap Urap and Olah Olah. My guess is that most can simply make it for you even if it’s not on the menu as all the ingredients can be found right there on the island. Have a wonderful trip and please let us know if you find other wonderful vegan places and vegan travel tips. Hello! My girlfriend and I are also vegan and considering travelling to Sumatra and/or other Indonesian islands soon. It is great to know we will be able to find some delicious vegan food! We were also wondering what your experience was as a lesbian couple in any of the places you visited, if you don’t mind sharing your perspective. We have heard that other than in Bali, public affection is not ok? Did you have any issues, for example with sharing rooms? hey! 😀 thank you for your appreciation for foods from my country, indonesia. 🙂 i hope you would love to try the other like lontok, opor tahu tempeh, etc. Ohhh wow I love this post! Making me hungry. I’m so pleased to see Vegan food available in Indonesia! Hoping to travel there one day. Great blog!